Can you believe that we're almost halfway through July already? What is going on?!? Summer needs to slow down NOW. Camp Mom was a bit lackluster this past week thanks to me getting sick on the 4th of July. I ended up canceling most of our plans and we just stayed home. I did my best to keep up with all of our activities, but we did have to cancel the big outing that was on the schedule. I had a fever and a cold which was followed by Lexie, a kid who NEVER gets sick, getting a UTI. We were a memorable pair at Urgent Care on Saturday afternoon. She was in a lot of pain and I was practically delirious from a fever. The good news? Lexie is feeling much better after starting antibiotics and my fever finally broke after 6 long days! Despite the illness and Lexie and Lily's sadness over their cousin being in Florida all week instead of with us, we still managed to have some fun! Well...they did. I just focused on staying upright! You can cut the recipe to make a smaller amount or double it to make more. I've found that 12 cups flour mixed with 1 1/2 cups baby oil works well for us! 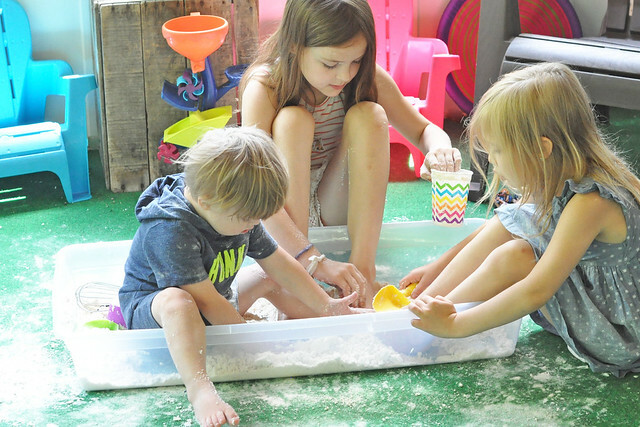 You can put the sensory bin on the floor or on a table. 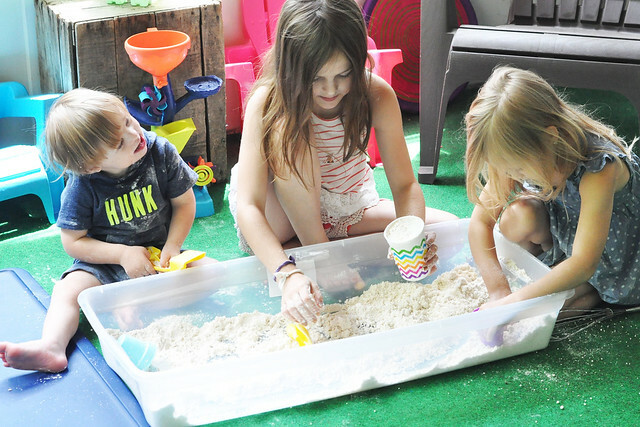 Toss in some sand toys (or pretty much anything) and let them play! They somehow always end up IN the sensory bin! Each batch usually lasts us a few weeks. Some extra perks to playing with Cloud Dough? It smells amazing (lavender is our favorite baby oil scent) and it helps moisturize dry hands! Instead of our outing, we opted for this at-home activity. Everybody was sending me pictures of the shaving cream slide, so I figured it was a good time to try it. 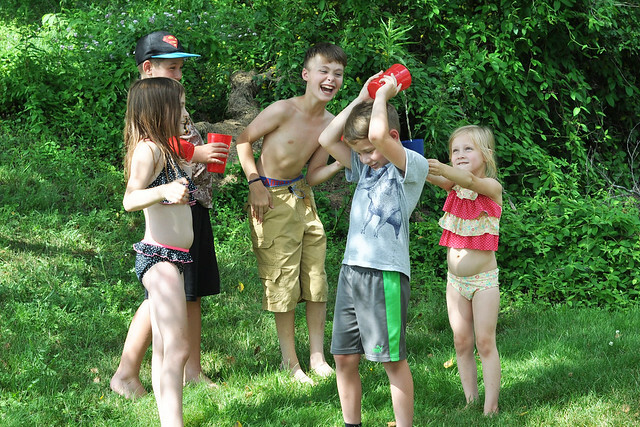 The kids did have a lot of fun! 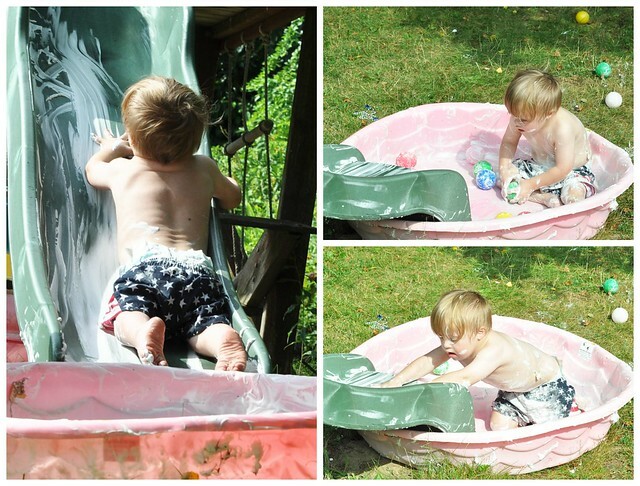 I didn't make it a rainbow slide because I figured the shaving cream would be gone in no time (I was right), but I did add a little baby pool to the bottom of the slide! 3 cans of shaving cream provided over an hour of entertainment! This is a simple game for a group of kids! Line them up tallest to shortest and hand them each a cup. Fill the first cup with water. 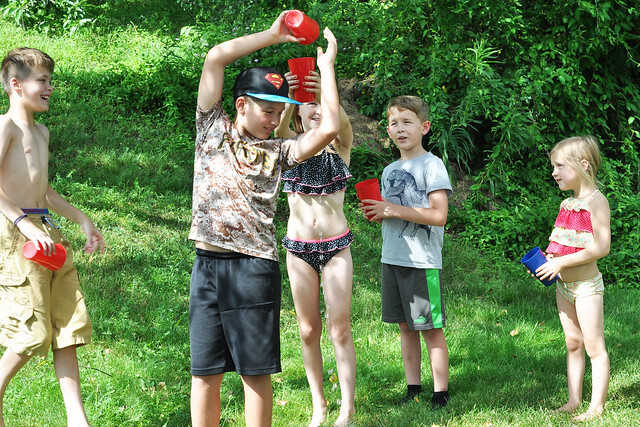 They have to reach up and over their heads and pour the cup of water into the cup the person behind them is holding without looking. The goal is to have the majority of the water reach the last cup in line! 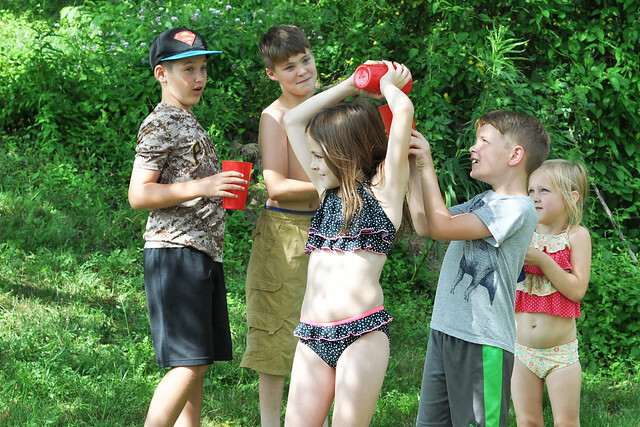 They played this game several times and it always ended in laughter! 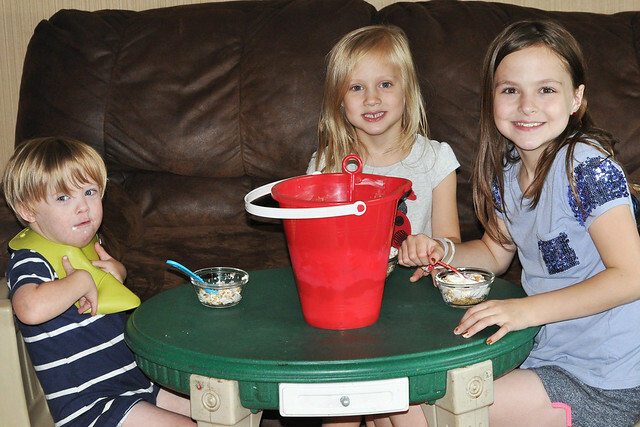 The girls and I made this yummy dessert together! Crush the vanilla wafers and the Oreos and mix them together. Set aside. Mix the pudding and the milk. Set aside. Mix 12 oz softened Cool Whip, 8 oz softened cream cheese and the 1/2 stick softened butter together. Mix the pudding mixture and the Cool Whip mixture together. 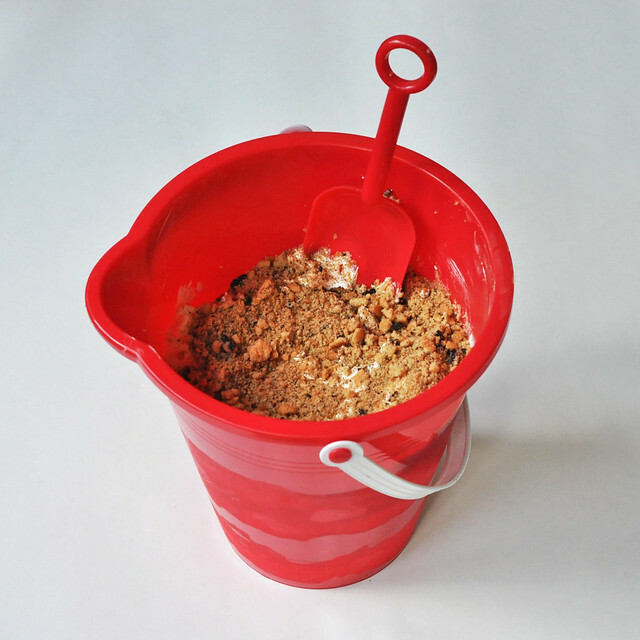 Place a thin layer of "sand" (vanilla wafer and Oreo mix) on the bottom of a beach pail. Add a think layer of the pudding/Cool Whip Mixture. Add a think layer of sand. Add a thin layer of the leftover Cool Whip. Add a think layer of sand. Repeat until everything is used. Top with a layer of "sand." Use the sand shovel to serve. My kids loved it and we had it again after dinner! 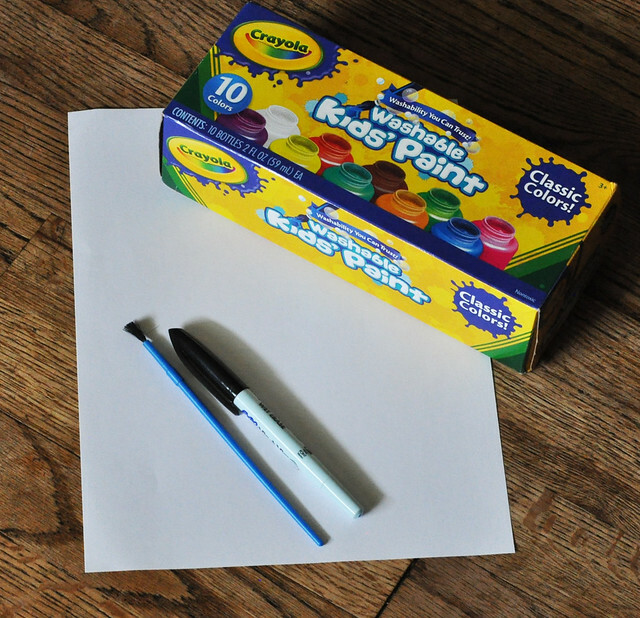 This is a very easy craft that even young kids can do! 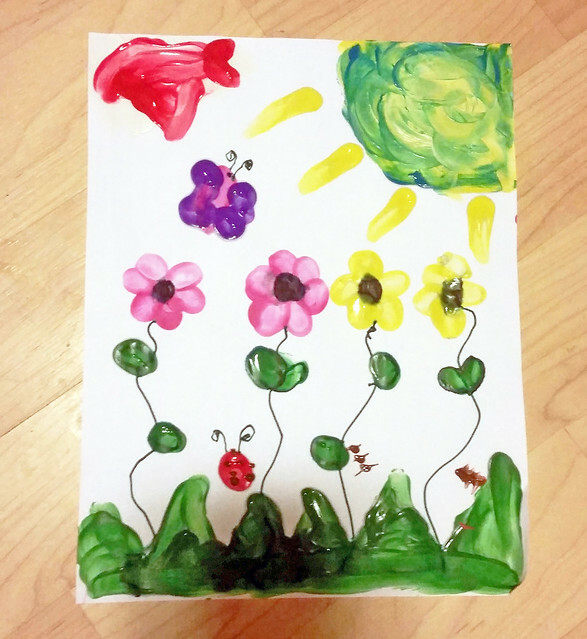 Have your child make black dots on the paper for the center of the flowers. 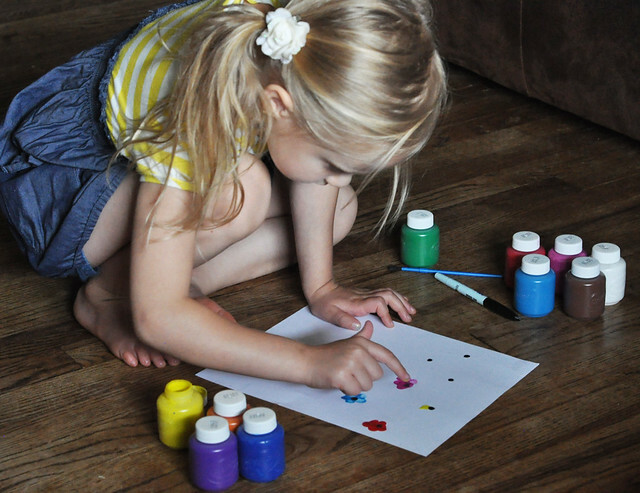 Dip a finger in the paint and have your child make fingerprints around the circumference of the black dots. 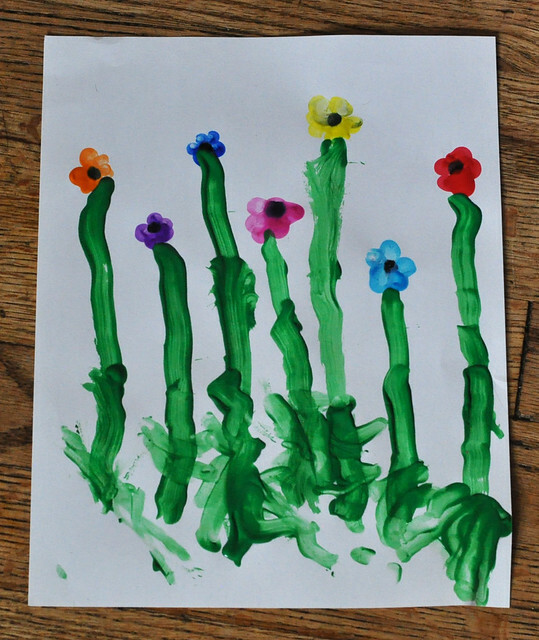 Use the green marker to draw stems or let them paint the stems with a paintbrush and green paint. Finger paint the blades of grass on the bottom of the picture. 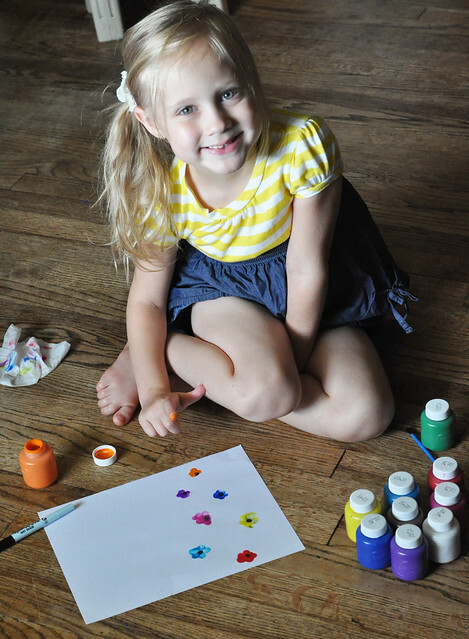 Lily had so much fun making her fingerprint flower craft! Lexie made her own version later with a few extra details. She informed me that painting with a brush is so much easier, but finger painting is therapeutic! Camp Mom Week Five is a wrap! Somehow, despite the germs, we survived and still managed to have fun! 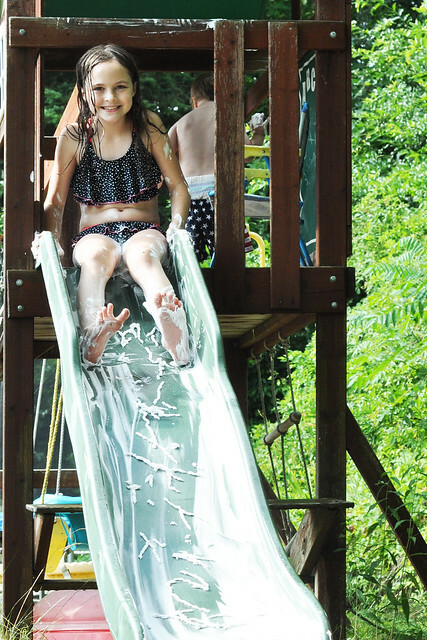 The shaving cream slide looks like a blast! I love all of your ideas so much. And glad you adn Lexie are feeling better. If I wasn't sick, I would have totally tried it! Aaaahhh! Those flowers are so sweet. I love the shave cream slide too. A little messy fun is always good (when outside ;) ). Summer needs to slow down pronto! I'm a firm believer in letting them get messy! More great ideas! You are on FIRE, girl! Thanks, Lindsay! I didn't think I would be able to keep up with it, but a simple activity each week day is doable! OH my gosh. Can I just send my boys to your house?! You all have so much fun! Send them over! I won't notice! Haha! These ideas are amazing! Thanks for all the great tips. Definitely making that pudding and doing the shaving Creme slide! Thanks, Chanel! The pudding was actually really good! Camp Mom is amazing! I love the cloud dough. I can't wait to try it. The pail pudding looks fun to make. Loving the flower paintings too. 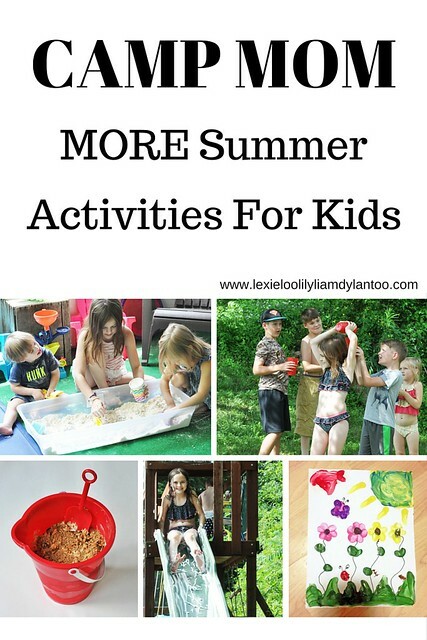 Great ideas and your kids will look back on all of the fun things you did with them with such warm hearts. Have a great night! 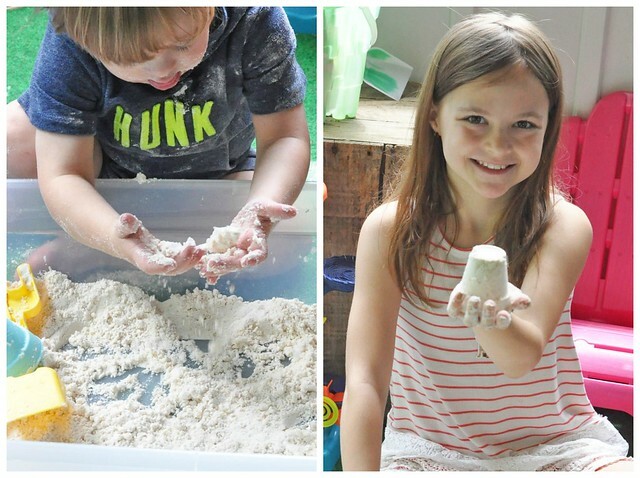 We made cloud dough over spring break & my kids loved it! 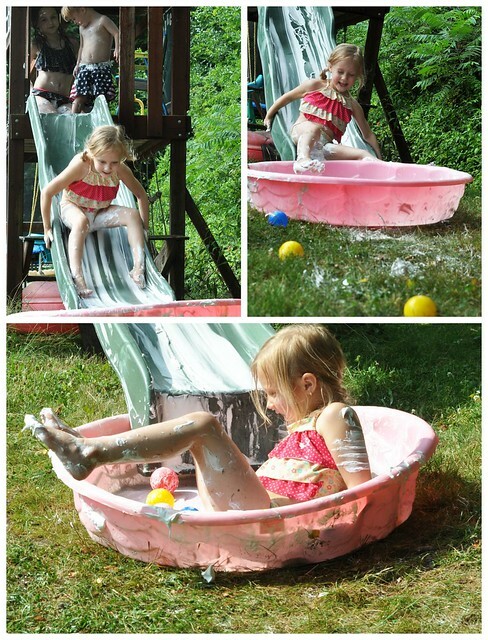 The shaving cream slide looks so fun! I can't wait to check out the kool aid lip balm. I know I've said this before, but seriously you are the most fun mom ever! I'm especially impressed knowing how little sleep you run on! Awww, thank you! We made the Kool-aid lip balm yesterday and the girls love it! How fun! I totally can't believe how fast the time is going either. This is awesome! So glad you both are feeling better and I agree, summer needs to slow down. Thank you! It really is flying by, isn't it? These ideas are awesome! Thank you, I'm always on the lookout for new ways to entertain my kids, so we're totally going to make that cloud dough! Thanks, Jessica! 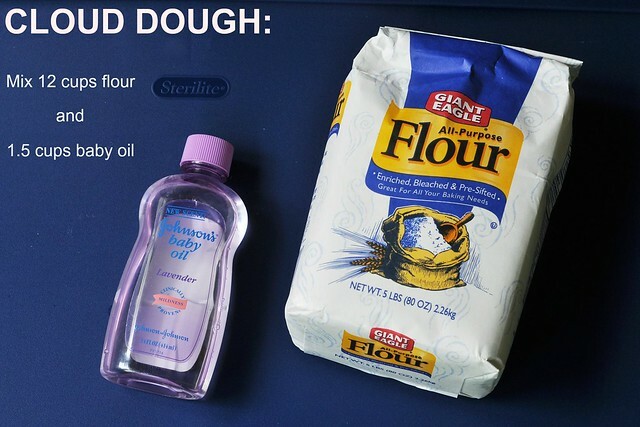 The cloud dough is definitely an easy one!